Spire & Co is so excited to announce our first month-long challenge! For women, summer most often brings a narrative imbued with losing weight, looking great, and achieving the ideal “bikini body.” We are constantly inundated with the idea that true happiness and fulfillment begins with the outside. We’re here to flip this message on its head. And while, at our core, we all know none of this surface-level stuff really matters, it doesn’t make it any easier to ignore or rise above all the noise given to us by social media and the like. Spire & Co is here not to send you through a bikini boot camp, but one of the self-love variety. Over the next month, you’ll find weekly self-love challenges and affirmations all within the safety of an inspiring and loving community. 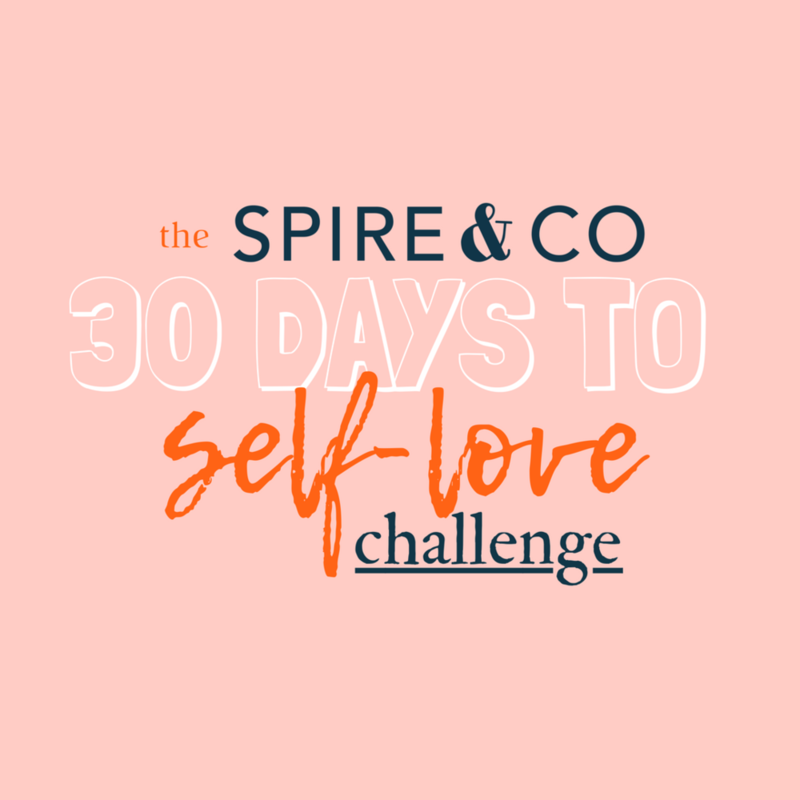 Welcome to week one of Spire & Co’s ‘30 Days to Self-Love Challenge.’ Firstly, congratulations on making this huge step towards providing yourself with the love, affirmation, and care you are beyond worthy of. You are beautiful, strong, capable, smart, one-of-a-kind, and deserve to be seen and treated as such by yourself and others. Week 1 is dedicated to figuring out your “why.” This step is crucial, it will provide the fuel and motivation you need to carry yourself through the next month, and then, hopefully, the rest of your life. Maybe you want to learn to love yourself in order to begin exploring new, and deeper relationships with those around you. Maybe you want to wrap yourself up in the affirmation you have been so desperately needing. Maybe you just want to begin to explore who you really are and understand that this is necessary for doing so. You’re so hard on yourself. Take a moment. Sit back. Marvel at your life: at the grief that softened you, at the heartache that widened you, at the suffering that strengthened you. Despite everything, you still grow. Be proud of this. Even in the moments of heartache and doubt, of struggle and pain, I can come back to these words and be reminded of everything I have overcome thus far. Take this quotation or another that speaks to your soul, and write it on a post-it note. Stick it to your mirror and remember that you yourself are a wonder. Your life, your body, your soul, your mind, these are all incredibly beautiful and unique things worthy of celebration and adoration. As you move through this next week, reiterate your why over, and over, and over again. Say it out loud. You cannot say it enough. There is no amount of love that is too high or too much. Congratulations on making it through Week 1 of Spire & Co’s 30 Days to Self-Love Challenge. You chose to start this journey and have stuck with it for a whole entire week. That is amazing. You are amazing. The hardest part is over, we promise. Week 2 is all about getting to know your strengths and familiarizing yourself with the things that make you so darn special. While we may understand that we are wholly unique from one another, we often neglect to truly unearth and understand what makes us one-of-a-kind. So, pull out your notebook again and begin to critically think about what you believe sets you apart from others. Maybe it’s your ability to add levity to tough situations, maybe you have an incredibly positive spirit, or maybe you radiate kindness so brightly that you’re practically glowing. Whatever your traits are, write them down. Once you feel that you have a comprehensive list, highlight the traits you feel are your strongest or most defining. In other words, if someone were to ask you to give an elevator pitch about the deepest, most nourishing parts of your soul, what would you tell them? You may be wondering why this step even exists. It may seem incredibly banal to you at this very moment. But, I promise you, it is immensely important. Just as it was important to cite the reasons you wanted to begin this process, it is equally as vital to begin building yourself up. Focus on what makes you different, what makes you strong and brave. We are so commonly focused on our lack, and by switching our attention to what is, what exists in abundance, we are able to begin to cognitively shift the way we think. It’s no longer, “I wish that...,” it can be, “I love that...,” or “I am proud of....” You are so much more than the sum of your insecurities. You are bursting at the seams with greatness. Acknowledge that greatness, and make it the focal point of your life. Loving yourself is not selfish. Loving yourself is to afford yourself the gentleness and patience you deserve. By honing in on what we love or admire about ourselves, we can begin to take charge of our life in an incredibly positive and nourishing way. It’s not about comparison or a belief in shortcomings, but, instead, a celebration of what is. This list you have compiled is something you should reference every single day. Our default is to pick ourselves apart. By constantly reminding ourselves of what makes us, us, we are able to push back on all of that negativity and move closer to rejoicing in our body and our minds each and every day. To join the 30 Days to Self-Love Challenge, sign up for our Monday motivation email, the Energy Email. We'll send you the weekly challenges and downloadable worksheets so you can be well on your way to self-love. Sign up with your email address and we’ll send the weekly challenge directly to your inbox plus some self-love downloadable worksheets. Thank you! We look forward to going on this self-love journey with you.